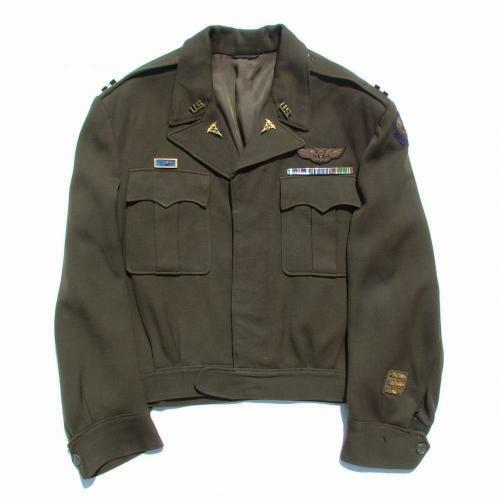 Lovely dark green/brown 'chocolate' 'Ike' jacket. Fitted with an excellent bullion 8th AF shoulder patch, bullion flight surgeon wing, matched pin-backed 'U.S.' collar insignia by Firmin of London, matched army medical administrative corps collar badges by J.R. Gaunt of London, pin-backed Captain rank insignia, medal ribbons for the DFC, American campaign and European Theatre of Operations (ETO). Also has a distinguished unit citation badge with oakleaf and 3 bullion overseas sleeve bars. Issue label is washed out. Indistictly named at the collar to 'T' E' Dillom'? One cuff button is missing and there is a small hole in the other cuff otherwise in very good used condition. Stock code U21395.